The holidays are rapidly approaching. I think you’ll agree, wherever you may reside, that ‘Christmas’ is already on display in many major shopping malls! As a small shopkeeper, I’m also guilty of rushing along the season. My ‘Christmas in the Country ~ Holiday Open House also occurs mid-November… a few short weeks away! 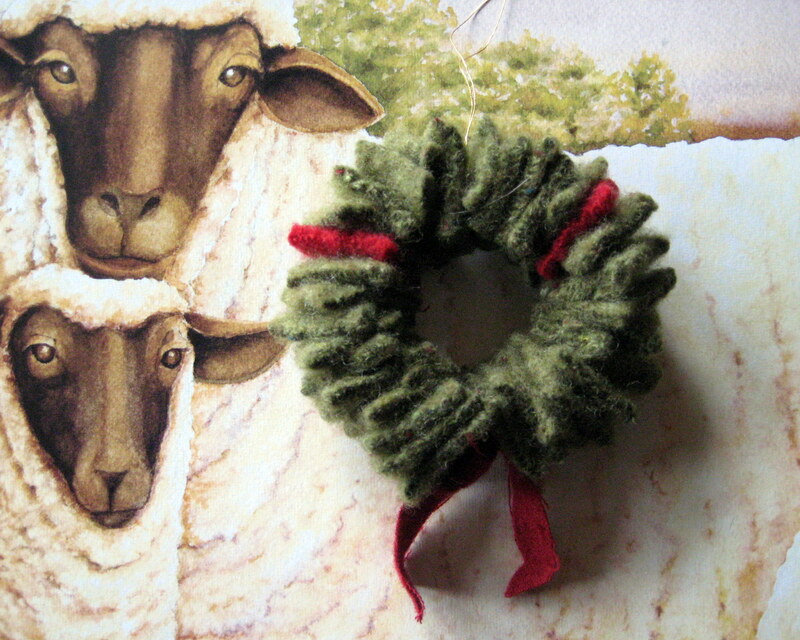 …and I’ve been busy preparing, creating fiber art, making goat milk soap and other primitives. Replacing, re-stocking, RE-THINKING. There’s much to prepare for such an event and it’s often overwhelming. I do the best I can, God-willing. So, I need to remind myself slow down and be thankful, and give thanks for all the goodness in my life. The spirit of Christmas lives 365-days a year! 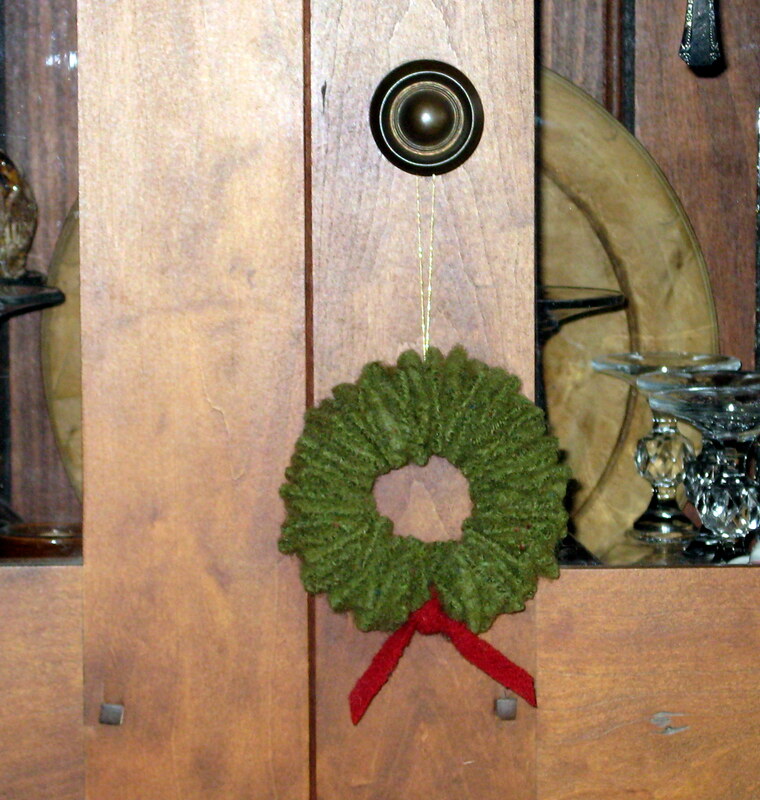 A few days ago I whipped-up this little wreath for Fall/Thanksgiving… a mini-wreath! 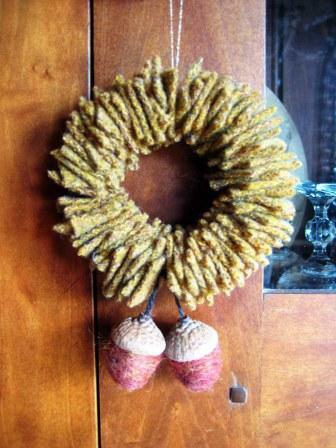 I cut little square swatches of recycled wool, strung them with florist wire, attached a gold thread to hang and needle felted wooly ‘acorns’ using the ‘tops’ from real acorns. Let’s not short-change Thanksgiving! So, pull out the Indian corn, wreaths, garlands, pumpkins, trencher-filled gourds, wheat topiary, corn stalks, acorns and everything that speaks Thanksgiving to you!